Low temperatures and big-sized heaters when there is not enough space in your room is the last thing you might want when the weather gets freezing. That is why Comfort Zone’s space heater is the right choice for those of you looking to save space, portable and powerful space heater to make your living environment feel cozy and comfortable. Moreover, the great features that come with this heater will cut down your electricity bills. We will begin with the compact size of this product – it is tall and slim and can fit any space in your room. There is an indent at the back of the heater where you can put your fingers, pick it up and carry it easily. This grip is indeed convenient as it serves as a storage space for the product’s remote control, too. Also, due to being lightweight, you can quickly move it from one room to the other, depending on where you want it to blow warm air. What is more, you can even take the unit with you when going on holiday or use it in your mobile homes. The fan can operate in 3 modes (Low, Medium and High), each with a different measure of electrical power, ranging from 800w at the lowest to 1500w at the highest. You can adjust the temperature settings from 41°F to 90°F, too and thanks to the digital thermostat, the unit will not overheat when working. Also, with the ECO mode feature, the Comfort Zone’s product will automatically stop heating when the desired warmth in the room is achieved and this way you will not get high utility bills. 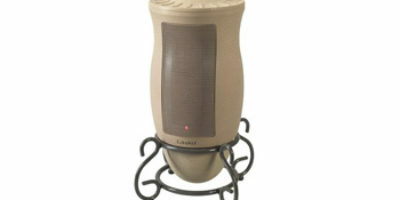 Another great feature is the oscillation fan that moves at a 70° to give you even and quick warmth of your living space. You can turn this function on or off depending on your preferences. The next technological characteristic will be a beneficial advantage to those of you who like having things done in advance. The timer that this heater comes with can be programmed up to 8 hours and allow you to decide when you want the unit to be turned off. Unfortunately, this function cannot be set to turn on the unit. Finally, this space heater comes with a remote to let you control the product while sitting in your coach, for example. However, the clicker has only buttons so you will not be able to check the temperature settings unless you get closer to the heater itself where the digital display actually is. What we really like about this unit’s characteristics is the Stay Cool body feature which prevents the front part of the product from getting too hot. This way, if touched accidentally, the unit will not burn your fingers, for example, and therefore you will not worry when your nosy pets want to sniff at it or pat it. The same goes when children are playing around, especially when the heater is pushed down or kicked off unintentionally. The in-built switch in the unit will turn off the product right away when it is not in a standing position. Another safety feature is the digital thermostat which will ensure the space heater does not exceed the maximum temperature and therefore prevent it from overheating. 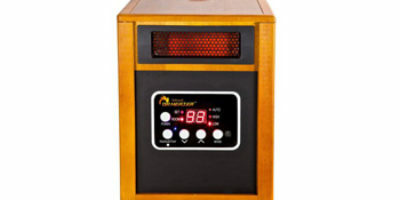 The Comfort Zone’s space heater comes with a 1-year warranty valid from the date of purchase.